I went camping this past weekend. As I mentioned in the Mexican Train domino game review I published the other week, dominoes seem like a good durable piece of gaming equipment for rough terrain and weathered environments. I took my double-twelve domino set on the camping trip and we played a few rounds of Mexican Train. It worked well. The dominoes got very dirty as you might expect, however. I would recommend keeping two sets of dominoes, one for indoor use and another for outdoor use. It also might be good to clean the outdoor dominoes from time to time. The biggest downside to taking a double-twelve set of dominoes camping is that it significantly adds to the weight I carry on the hiking trail. I have a travel sized double-six domino set that is approximately the size and weight of a pack of playing cards. Games played with double six dominoes I feel are over too quickly and tend to leave me hungry for more, though I have begun browsing through domino game rules that use a double-six set to see if there are any exceptions that will prove me wrong. In the meantime it seems the most logical piece of gaming equipment to take the place of the double-twelve domino set in a camping situation would be the classic deck of cards. While not as durable, standard decks of playing cards are cheap and easily replaceable. Most importantly they are very light and easy to pack. My wife gets bored from time to time as was the case last night. When she gets bored she corners me and demands that we play a game together. When we can’t agree on a game, we usually look up a new game neither of us have played. That way we have the greatest potential of being equally bad at something new. And if one of us happens to be naturally good at playing the new game, the other can chalk it up to beginner’s luck without feeling taken advantage of. Last night’s new game is called Twenty-Two. 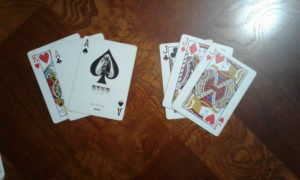 It is played with a standard deck of 52 cards, four suits ace to king sans jokers. The cards are ranked such that aces are high and twos are low. All suits are equally ranked. Twenty-Two is a trick taking game sort of like Hearts, Spades or Euchre, but with a great deal of difference in objective and strategy of gameplay. The objective for the player when playing Twenty-Two is to be the last player with a total score less than 22 points. Any number of players can play Twenty-Two. For every six players, simply add another deck of cards. So 2-6 players, play with one deck. For 6-12 players, play with two decks, and so forth. Each player is dealt seven cards by the dealer. The first dealer is chosen by everyone drawing a card from the deck, highest card is dealer, ties are redrawn. After the cards have been dealt, the players beginning with the player to the left of the dealer, may choose to discard any number of cards up to and including their full hand and redraw that number of cards from the draw pile. If you’ve got good cards you don’t have to do this, but this is probably the most important mechanic of Twenty-Two. If the number of cards in the deck run out before everyone has a chance to do this, the remaining players are out of luck and the first trick begins. Right player led with three jacks. 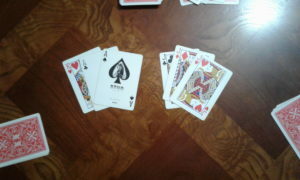 Left player won the trick with two aces and a king. 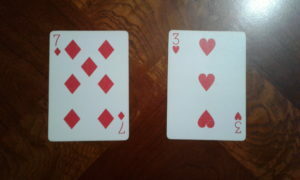 The player to the left of the dealer begins the first trick. A card or multiple cards of any one rank may be played. 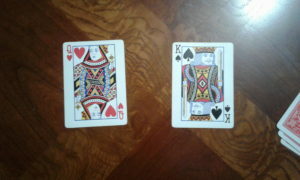 In one of our games three jacks were led, but it would have been illegal to begin a trick with two jacks and a queen. Play then continues clockwise with each player attempting to beat or equal the leading cards. For instance, with three jacks led a player could beat the jacks by playing three queens or two queens and a jack. The next player could beat the second player’s play with three kings and so forth. If a player cannot beat the highest valued play in the trick before him, he must play his lowest cards. So if three kings are now the highest valued cards in play, he must play the three lowest cards in his hand. Left player then leads the second trick with a queen. Right player wins this trick with a king. As soon as everyone has made their play, the player with the highest ranked play wins the trick. That player then leads the next trick. Any number of cards of the same rank may be played to lead any trick, but the last card in everyone’s hand must always be saved for the last trick. On the last trick, everyone plays their card to see who had the highest card. 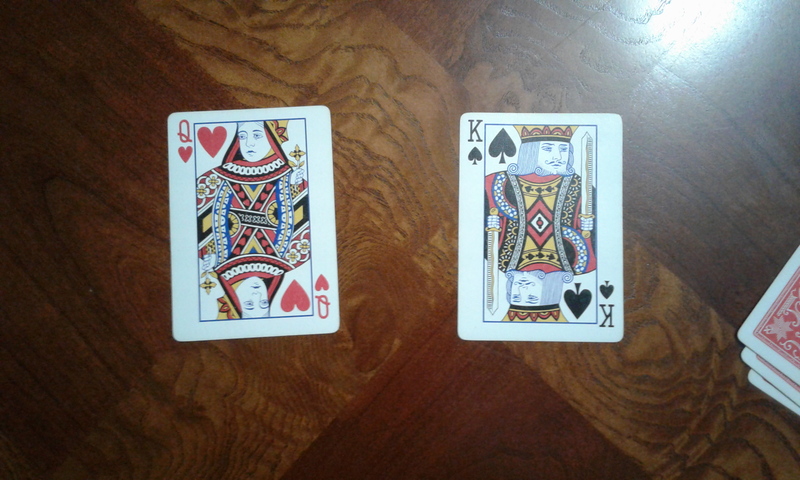 The player with the highest ranked card, or players in case of a tie, in the final trick lost the round of play. They keep their final card to the side as their score. If they rack up the equivalent of 22 or more points in last round cards, they are eliminated from the game. Number cards are scored at their numeric value. Face cards are worth 10 points, and aces are worth 11 points. 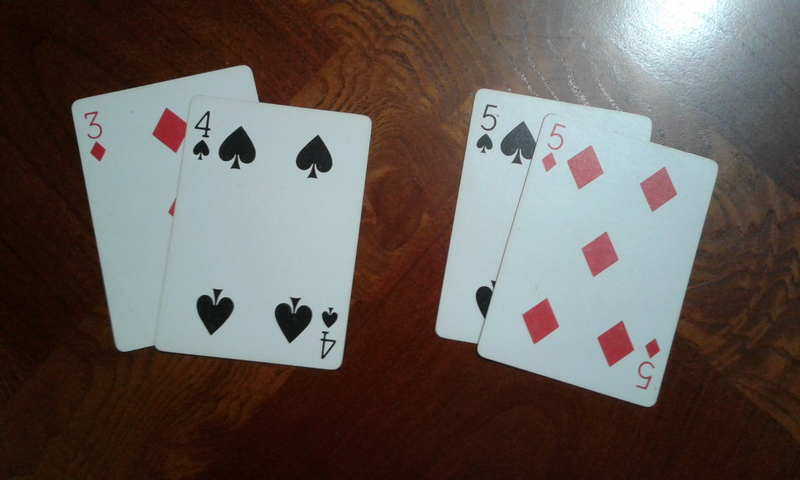 Right player leads third trick with two fives. Unable to beat both fives, the left player plays his two lowest cards. The person who lost the round becomes the new dealer who deals out seven cards to each player and play continues in the next round. If there is a tie, the tied players draw for who is dealer; the player with the highest draw becomes dealer. The game continues until all but one player is eliminated from the game. The last player standing is the winner. In the final trick, the left player has the highest card. He loses and becomes the dealer for the next round. In playing Twenty-Two I found myself having to figure out new strategies I’m not used to in a card game. On one hand, you don’t want to run out of low ranked cards in your hand so you can have the lowest card possible in the final trick. This makes the game kind of like Hearts. On the other hand, if you are not taking tricks, you’re at risk of being forced to play a higher card during the final trick, which makes me want to play the game more like Spades. The need to think about these things while balancing my hand make this game really fascinating. Twenty-Two is an easy to learn and easy to teach card game that can be played in most any setting with any number of players. Because of its versatility, I would recommend this game for any setting where other games are unfeasible due to the size of the group or the difficulty of setup in the physical environment.